We almost never get take out Chinese food anymore. It's too greasy and it makes us feel ill. So I occasionally make a healthier swap like this one so that we get some of those flavors without all the gross add ins and grease. This recipe is super quick and easy (my favorite way to cook). It might seem like it has alot of ingredients, but you most likely have these in your pantry already (with the exception of the seasoned rice vinegar). Preheat oven to 400 degrees and either spray pan or line with parchment paper. Cut your chicken into bite sized pieces (But don't bite them. They are still raw.) Put your egg white and squirt of hot sauce in a small bowl and whisk it. Put some flour, salt and pepper in another bowl and stir (I probably put 1/2 cup flour in the bowl). Dip your chicken in the egg, then in the flour and put it on your lined baking sheet. Bake for 15-17 minutes. While it is baking, make your sauce. To make the sauce, combine water and cornstarch in a sauce pan and stir to dissolve. Heat the burner to medium low heat and add the other sauce ingredients (except for the sesame seeds and red pepper flakes). Let it heat for a few minutes, stirring occasionally, until it thickens up. Once the chicken is done, put it in a bowl and pour the sauce over it along with the sesame seeds and optional red pepper flakes and toss to coat. We had ours with sticky jasmine rice and roasted zucchini and red pepper. So good! Ok, so I thought I'd update you on some home stuff we've been doing. For those of you who do not know, my husband and I bought our first house and have been settling in for the past 3 weeks. 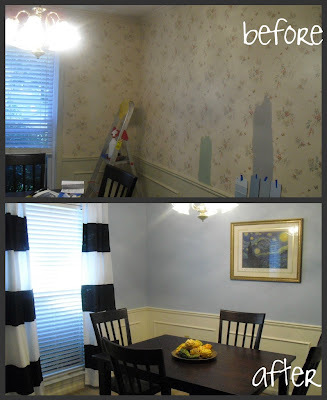 We took down the dreaded wallpaper, painted the walls light blue and the trim a creamy cotton beige color. I bought some white curtains from Target and painted bold black stripes on them. We also spray painted the brass light fixture with a hammered finish bronze paint, but you can't really tell from this picture. Another project to show off is the pallet daybed in my craft/guest room. My dad and I made this using 2 pallets that we cleaned up and sanded. We bracketed them together and added caster wheels. It was a fun and easy project. If anyone has checked out my Pinterest For the Home Board, you know I have a slight obsession with re-purposed pallets. The inspiration for my curtains is also on that board. Love your renovation! And I agree with you about Chinese food. I love making my own too. Thanks for linking up this week! Hey! I'm Renee and I love to cook, bake and sometimes craft. I started this blog to fill my boring office days. I'm so glad you are here looking at my site! I also blog over at Endless Simmer on the occasion. Pop over there and say hi!